for a visual display of how Vionic with Orthaheel Technology can align your foot and leg. 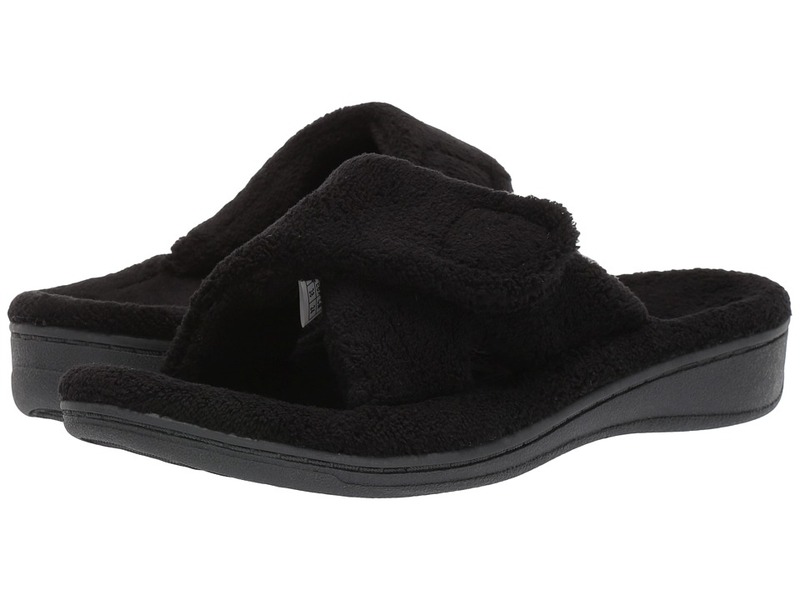 Take it easy and unwind in the designed-for-comfort Relax Slipper from Vionic® with Orthaheel® Technology. Innovative, podiatrist-designed Orthaheel Technology provides superior orthotic support, relief, and stability to help realign the feet to their natural position. Clinically shown to help relieve common causes of heel pain or plantar fasciitis, and knee pain related to over pronation and flat feet. Received APMA Seal of Acceptance. to view Seal. Plush fabric upper and liner surrounds your feet in complete comfort and warmth. Fully adjustable hook-and-loop closure across the instep provides customization for a personalized fit. Fabric-covered footbed is treated with antibacterial, odor-resistant Ecofresh to keep your feet feeling fresh. Podiatrist-designed, biomechanical orthotic footbed with deep heel cup stabilizes, supports and realigns the feet back to their natural position. Lightweight, flexible medium-density EVA midsole absorbs shock to reduce stress on the feet, ankles and knees. Durable TPR outsole with wave-patterned tread provides traction to maintain your confident stride. Care: Wipe off with damp cloth and air dry. For further information on the benefits of Orthaheel footwear, please visit our Zappos blog: ; Imported. Measurements: ; Heel Height: 1 in ; Weight: 8 oz ; Product measurements were taken using size 8, width M. Please note that measurements may vary by size. Didn’t find the Slippers you were looking for? How about these? Satiny and sleek, this ballet slipper provides practical around-the-house fit….